This entry was posted on Saturday, December 21st, 2013 at 11:11 pm and is filed under America's founding, Bad Quotes, Bogus history, Good Quotes, History, History Revisionism, Religious Freedom, Thanksgiving, Voodoo history. You can follow any responses to this entry through the RSS 2.0 feed. You can leave a response, or trackback from your own site. Does that obtain for the Plymouth colony, BF? Who were the rich people, and how much more did they produce, of what, than they consumed? There’s where your ignorance betrays you. Rich people don’t cause poor people to starve. Rich people are rich generally because they know how to produce more than they consume. Socialism is a horrific disease for it places the onus on YOUR wants upon ANOTHER to provide. You, yourself, are clueless how to produce for yourself and rely on those around you to do so. The end -as all Socialist experiments end in history – in mass starvation. Well you have to understand, Ed, BF thinks it was socialism because he think the rich people at plymouth should have gotten 99.999999% of the food and that everyone else were just lazy slackers so they should have had the sense to off and die of starvation. History might shed some different light on your claims, BF. 1. When you get off the boat on December 20, the harvest for the year won’t be bountiful. It wasn’t socialism that hurt the Plymouth colony so badly that first year, but timing. 2. Socialism wasn’t enforced. The colony was created under a charter with a private company to farm or mine to get goods back to England for sale. It was fascism at worst — but even that would be a difficult case to make. 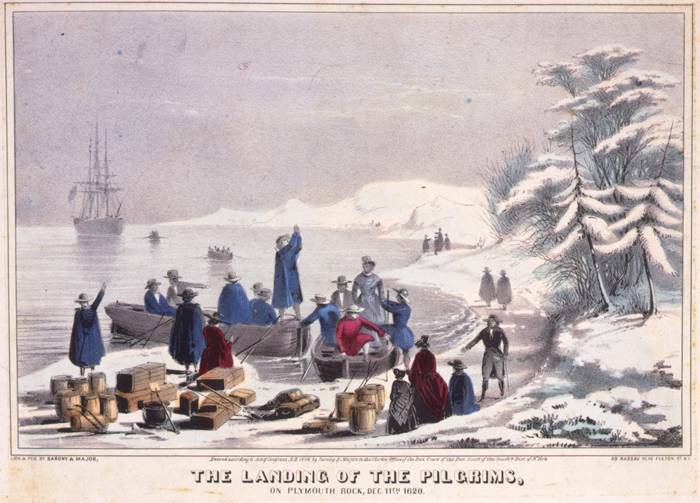 Most of the people who landed were craftsmen, put there to ply their crafts and make money at it, in the New World. The London Company expected — accurately — to find no coopers, or barrelmakers, in Virginia (nor Massachusetts, but we digress). So they sent barrelmakers along. In that day, transcontinental goods were shipped in barrels. No barrels, no shipping; no shipping, no trade, and no profit. You seem unaware that this was a profit-making enterprise, as much as it was not a theocracy. In fact, while mislabeling the episode as ‘private enteprise trumps socialism,’ even the hack historian Tom Bethell at the far-right-wing-never-give-an-inch-to-liberals-or-truth Hoover Institution, notes that it was the corporate drive for profits that threatened the Plymouth plantation — free market money and power concentration created the problem, including the “communal” arrangements. See Bethell’s piece here: “How Private Property Saved the Pilgrims.” This is the Tom Bethell who is a die-hard creationist, anti-science fan of DDT, and who entertains any number of other distortions of history, science, law and other parts of reality, in order to sustain his check from the sachems of Hoover. The Plymouth colony didn’t need private property so much as they needed food and information on how to grow food in New England. Private enterprise didn’t provide that; charity provided some of it. You highlight one of the issues the religionists tend to leave out: If God was looking out for this colonists, He did a bad job of it. Mae West’s remarks about another institution are probably appropriate here: “They say marriage is a great institution. But, honey, I ain’t ready for no institution.” Substitute “Hoover” for “marriage,” she was right. Yeah, and the rest of the story, Ed. Under such an arrangement, Socialism was enforced upon the party – resulting in a devastating lack of harvest and goods necessary to survive the winter. They mostly starved to death – some eating the remains of their dead children. The next year, such Socialism was abandoned and the result – bountiful harvest and a Thanksgiving.